Home » Mattress Pad vs Mattress Topper — Which Is Right for You? When it comes to customizing a bed to be perfectly suited to you and your needs, sometimes a mattress accessory can be a perfect choice. However, the difference between a mattress pad and a mattress topper can be quite confusing – and sometimes, to make matters worse, the two are used interchangeably. Here are the differences between the two, and the benefits and drawbacks of both. The right mattress is a key factor in getting enough, good quality sleep, while preventing issues such as back pain. But buying a whole new mattress can be an expensive endeavor. Alongside this, sometimes in rented accommodation it’s just not possible to switch out a mattress. In cases like these, buying a mattress accessory can be a great way to change the feel, firmness and support of the mattress without interfering with the mattress itself. Mattress accessories can help tweak the feel of a newly purchased mattress, either for yourself or for a guest or partner. But they can also rescue a mattress you’ve fallen out of love with, whether your tastes have changed or the mattress is simply past its best. Mattress pads come in a wide variety of types, for different bed-related needs. You can find heated pads (which a fitted with heating features to warm the bed), cooling pads (which can use a fan or liquid system to cool the bed – but can be expensive), fitted pads and anchor pads. Mattress pads are very easy to transport, move, and attach to a mattress. They are also generally inexpensive. Once attached, a mattress pad is stable and unlikely to move around, because of the way it clings to the mattress. Mattress pads are a great way to protect a mattress from moisture and stains – in fact, this is thought of as their primary function. They can be removed and laundered. Mattress pads can help reduce unwanted noise of a mattress or mattress protector. For the price and relative ease, mattress pads offer a small but possibly significant amount of added comfort and support to a mattress. Mattress pads can be flimsy and prone to damage, dependent on brand and type. Although they offer some change in comfort, mattress pads do not offer extra support, and may not be enough for you to feel a noticeable difference. 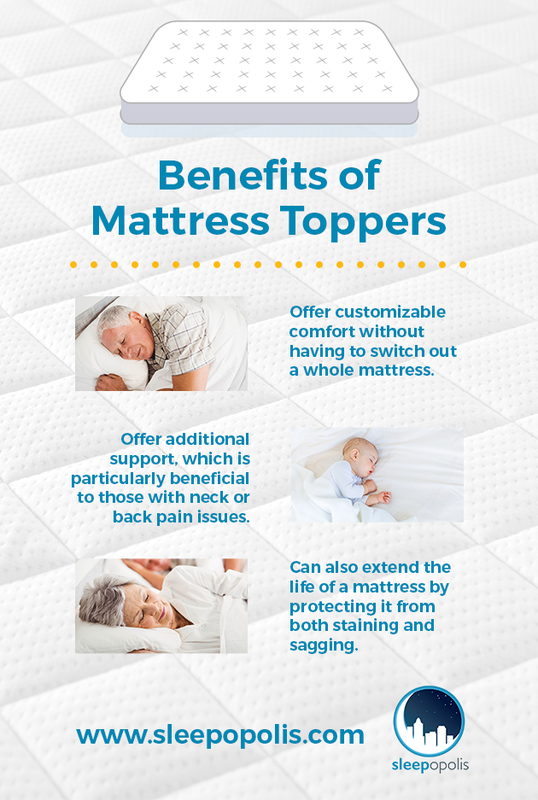 A mattress topper is more like a “mini mattress.” It’s a thin cushioned layer which can be stacked on top of a mattress to change the ways a mattress feels and how it supports the back and neck. Mattress toppers are typically made of foam, in order to offer a firm, supportive feel, or to give an innerspring mattress a foam feel. Foam mattress toppers can be made of foam latex or memory foam. Foam latex offers great firmness and slow bounce, but can be pricier, while memory foam offers great durability and body contouring, but can be stuffy and have a strong scent upon unboxing. Mattress toppers can also be made from wool, feather or other fibers. Mattress toppers offer customizable comfort without having to switch out a whole mattress. They can offer additional support, which is particularly beneficial to those with neck or back pain issues. Mattress toppers can also extend the life of a mattress by protecting it from both staining and sagging. Foam can make the bed warmer by insulating body heat. Mattress toppers can be cumbersome and difficult to maneuver. Because they’re essentially a large, flat foam cushion, toppers aren’t usually directly attached to the mattress. This means they can move around and become detached more easily. It can be difficult to clean a mattress topper. Mattress toppers can also be on the more expensive side, even up to hundreds of dollars. However, they are still usually a cheaper alternative to investing in a whole new mattress. Mattress toppers and mattress pads are quite distinct, and serve two different primary functions. Mattress pads offer more protection to the mattress, while the change in feel and comfort is minimal. They’re a great choice if you want to combine mattress protection with a slight benefit to your comfort, especially if you’re on a very tight budget. Mattress pads are also primarily very easy – to attach, to clean and to move. Mattress toppers are better for those who want or need a significant change in the feel or support of their mattress, but can’t or don’t wish to purchase a whole new mattress. They’re ideal to add customizable support, whether for comfort and preference or for medical needs such as pain and acid reflux. Toppers can also be useful to extend the life of a mattress or to spruce up a mattress that’s past its best. However, they can be expensive, cumbersome and slide around in the bed too easily. If you’re interested in buying a mattress topper or mattress pad and are curious to know how to make the best choice for you, check out Sleepopolis’s reviews of a wide variety of both mattress toppers and pads, available here. What Are the Best Blue Light Blockers for Me?